We're used to seeing tons of Mario tributes on the internet, in live action videos or custom-made browser games where Nintendo's mascot does things he wouldn't normally do. The Japanese publisher seems to turn something of a blind eye to most of these. But SOPA probably wouldn't. It's that supposition that powers NoLan Labs' Super SOPA Bros. Made as part of a protest game jam on rapid development site Ludum Dare, SSB strip out anything recognizable—and thus most of the charm—from World 1-1 of Super Mario Bros. I played it for about 10 minutes before I wanted to stop. That's ultimately the point, though. SOPA could possibly eliminate a whole category of creativity that references or comments on other creativity. As Stephen Totilo pointed out yesterday, it'd strangle use of copyrighted material and SOPA's vague language seems to indicate that any use of such material would be tantamount to piracy and a violation of the law, were it to pass. 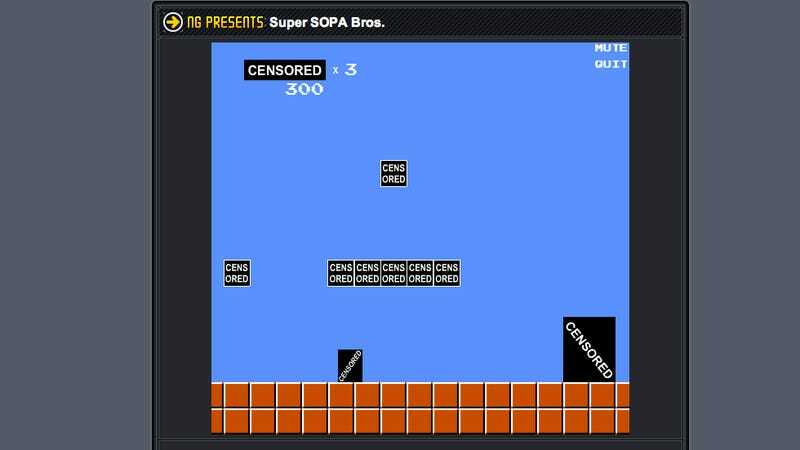 You can play Super SOPA Bros—if you want to—and the other Ludum Dare Stop SOPA Game Jam entries by visiting this page.